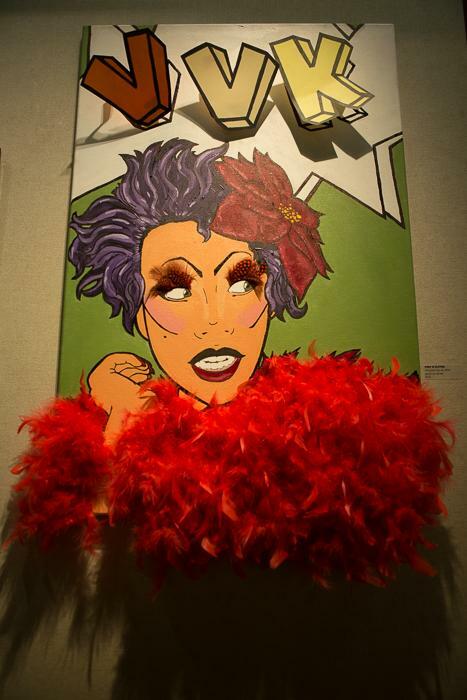 What grabs your attention when you walk into SCC’s art gallery? Is it the Boston Terrier, looking real enough to jump out and lick your face? The glamorous woman batting her red-feathered eyelashes at you? Maybe it’s the political leaders appearing to speak out? Or, the shapely ceramics drawing you in? Whatever turns your head, it’s all here. From bold to delicate, the Combined Club Show, is a joint effort between Clay Club, F-Stop Photography Club, VCT Club, and Art Club. Art types include ceramics, digital prints, drawings, printed fabric, and paintings in oil, acrylic, and watercolor. As you wend your way through the pedestal maze, spotlights highlight three-dimensional pieces. 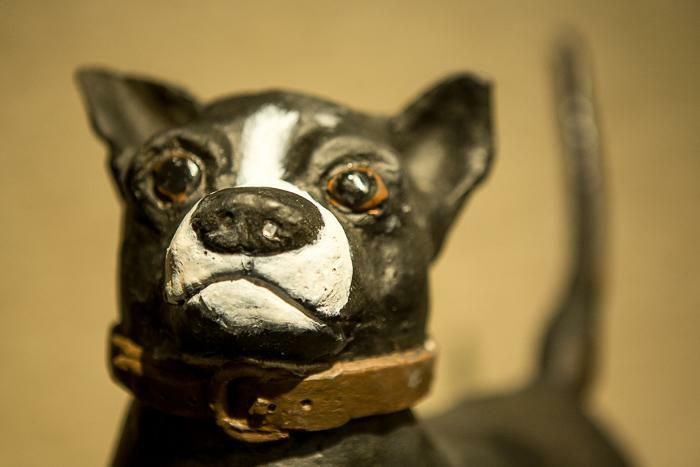 A menagerie of life-like ceramic beasts—a heavy copper-colored rhino, a high-tech polar bear, and those eager Boston Terriers—vie for your attention. Interspersed among the animals, you’ll find functional ceramic works—pots and plates, vessels and vases—in a variety of construction techniques, colors, finishes, and adornments. The vases are covered by glossy or matte colors ranging from starkly-contrasting black-and-white to subtle, oozing, earth tones, while textures suggesting buttons, suction cups, or grated cheese cling to surfaces of pots and plates. Gary Georger’s glossy black ceramic urn stands out. Both the body and lid are outlined and striped with brick-red slip. The lid’s three knobs are wrapped with flowing fiber ribbons weighted down with ceramic beads. Once through the maze, you’ll find spotlights and filtered lights illuminating details of two-dimensional art showcased along the gallery walls. Colorful paintings and photos alternate with black-and-white pieces, with topics that range from somber to fanciful. Color digital prints explore architectural angles, unknown faces, and the red-eyed pigeon. 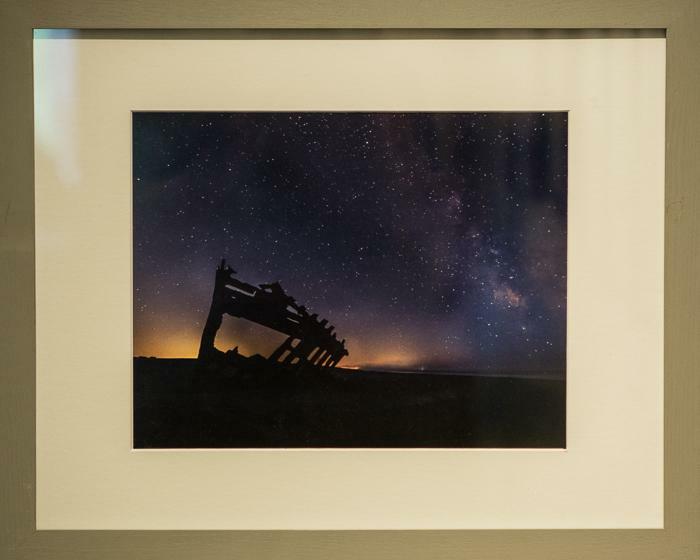 Fernando Guaren Jr.’s photograph “Shipwrecked,” shows the silhouette of a dilapidated ship against the sunset edge of a starry sky. The contrast is striking. Black-and-white oils and digital prints show a harsher side of life—leaders delivering urgent messages of political unrest and hands grasping rice grains, asking for aid to prevent starvation. Behind this impressive display of student art is the hard work and artistic awareness of Claire Putney, Director of SCC’s gallery. She teaches photography, drawing, and painting at SCC, and has managed the gallery for over a year. SCC’s gallery is located in the heart of the Administration Building—the 1000 Building. It is open weekdays, 8 a.m. to 5 p.m. through June 24.